The Westfield Historical Society successfully obtained a listing for the Reeve Property on the National Register of Historic Places in July 2005. Through the research, it was determined some of the important inhabitants of the property include: Brig. General John Myrick who was raised on the property from 1841 to 1855; William Stitt, the proprietor of the Westfield Hotel who owned and lived on the property from 1872 to 1898; and William Edgar Reeve, a prominent figure in the history of Westfield who purchased the property in 1906 and lived there until his death in 1962; and, subsequently his son Edgar Reeve, who occupied the house until his death in Dec. 2001. 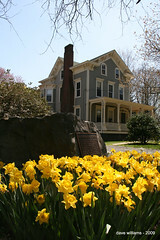 The Reeve House was deeded to the Town of Westfield in 1985 from Ralph and Edgar Reeve, the only descendents of the Reeve family. The deed was contingent upon the agreement that Edgar Reeve would live the rest of his life in the house and that the Town would have to use the property for only charitable, municipal or other public non-profit purposes. It is clear from the will of Edgar Reeve and other correspondence that he wanted the Westfield Historical Society to have use of the property and to realize his vision for a museum and resource center.